Hausermann’s Orchids is another favorite of Nature Artists’ Guild artists. On a cold wintry day, you can almost feel yourself relax when you step inside this greenhouse. Thousands of the orchids that Hausermann’s is famous for nationwide will be in bloom, just waiting for you to capture their beauty in your artwork. An area of the greenhouse has been set aside as a showroom with hundreds of orchid specimens which is where we can set up to sketch or paint. Even if you only take photographs for future inspiration, it is worth the effort to set aside some time to attend. Of course the orchids are also for sale, so if you’d like your “inspiration” to come home with you, that can be arranged! One lucky paint-out attendee will even receive a free orchid to take home. Unfortunately, space is limited so we have to limit the group to 15 artists. Please contact Ku-mie Kim if you’d like to come (you can find her contact information in the Yearbook or write a comment to this post and I’ll forward the information). We’ll be meeting at Hausermann’s on Friday, 02/04/10 from 9:30 to 12:30. They are located at 2N134 Addison Road, Villa Park, IL (see www.orchidsbyhausermann.com for directions and more information.). Bring a chair, your art supplies, and leave your parka at home! 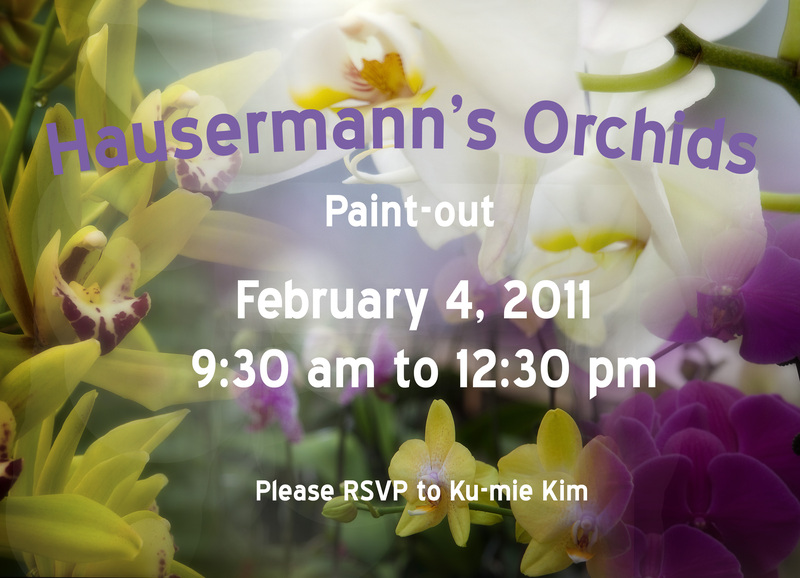 I would also like to attend Hausermann’s paint-out but do not have Ku-Mie’s e-mail. Can you please e-mail me that info or e-mail my message to Ku-mie? I let her know you’re coming. We’re getting a great response to this paint-out – it must be this cold, cold weather! I would also like to attend Hausermann’s paint-out but do not have Ku-Mie’s email. Can you please email me that info and put me on the list as an attendee? Sure! I’ve e-maile Ku-mie your message. Yes, I’m sure there is still room. If you can find your 2010 yearbook, Ku-mie’s e-mail and phone number are in there (we normally don’t like to put personal information on the blog). I’ll also forward your comment to Ku-mie and ask her to confirm with you. We’re glad you’re coming – it’s a nice place! By the way, the 2011 yearbooks are being mailed out today. I would like to attend this paint-out is there still room? You did not list Ku-mie Kim’s email above. How can I contact her?